Tom Wiselogel submitted this photo and caption. So many people contributed to the success of the Troopers this year that they would not all fit into a single photo. But here are three of the four people who really made it happen. From the left: Dieter Wiselogel (horn sergeant), Mike Ottoes (executive director) and Kyle Trader (drum major). Missing is corps director Fred Morris. While Mike and Fred got it done on the business and leadership end, Dieter and Kyle stepped up and got it done on the ground. 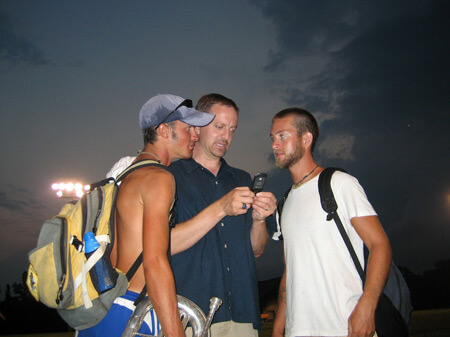 This photo was taken after the corps' final practice run-through the night before the World Championship Quarterfinals.